$2,500 fee with multiple mares. World Champion. 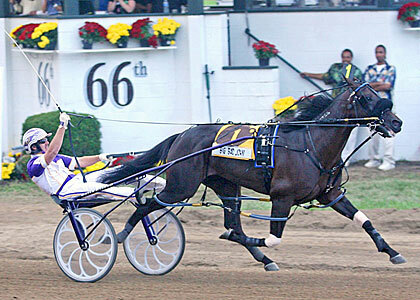 At 2, winner International Stallion S., Bluegrass S., leg Pennsylvania Sires S. at Pocono, The Standardbred, Arden Downs S., leg Pennsylvania Stallion Ser. at The Meadows; second in elim. Breeders Crown at Pocono, leg Pennsylvania Stallion Ser. at Chester. At 3, winner elim. and Final Little Brown Jug, 3 legs and Final Pennsylvania Sires S. at Chester, The Meadows, Oliver Wendell Holmes, Bluegrass S., elim. North America Cup; third in Battle Of The Brandywine P., elim. Breeders Crown at Woodbine.